Here in my home state of Maine, water and its associated lifeforms are in abundant supply. As such, I can – and do – absolutely plan on catching fish to accentuate my diet in case of emergency. Fortunately, fish are (relatively) easy to catch, and as long as you have just a smattering of moderately specialized fishing kits and a dash of know-how and water-reading ability, the fish-catching process can be simple and effective enough to almost guarantee you a fish dinner in exchange for your efforts. At the base level, unsophisticated fishing is (usually) productive, does not require the burning up of mass calorie reserves, and can be utilized as a food procurement method even by the inexperienced. While hooks and other fishing gear fashioned by whittling sticks or mutilating pop-top cans can work, life is so much simpler with properly-designed fishing apparatus. Actual wire fish hooks, split shot sinkers, and swivels are perfectly refined to do their intended jobs – so why not carry them with you in your bug-out bag, glove compartment, or emergency kit? If you live in an area that has an abundance of fishable water, there is zero reason not to have these tools with you – they are terribly inexpensive, take up almost no space, are very light, and are reusable as long as they are not lost or damaged beyond repair. I don’t want a full-on tackle box rattling around in my bug-out bag, so I devised a makeshift fishing kit that has everything I need for tackle for set-line bait-fishing, in a small package that floats. Assuming you have a couple basic tools, this kit costs practically nothing and is super easy to to make and customize. Here’s what I came up with. Though I’m sure someone else can lay claim to being the originator of this idea or something like it, the idea came to my head when I saw a pile of wine corks on the counter after one of my wife’s “girl’s nights” where my ol’lady and her ol’ friends gather about, drink wine, and gossip while I disappear into my man-cave, putter about, and watch Clint Eastwood movies. 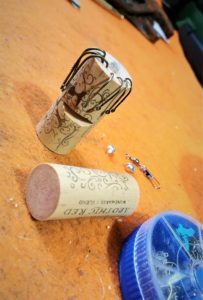 I wondered what I could do with this seemingly infinitely renewable resource (Girl’s Nights becoming more and more popular, it seems), and thought that the lightweight corks would make great fishing bobbers since they float beautifully. The idea evolved from there, and what I propose below is the product of my (meager) brain power applied to the problem. The concept will likely morph further, (your ideas welcome!) but is eminently useful as-is, for my intended short-term SHTF fishing needs. Here’s what I did. Corks: I like the synthetic plastic fake wood corks best for this project, since they don’t crumble and break apart as readily as real wood cork, especially when drilling and working them. 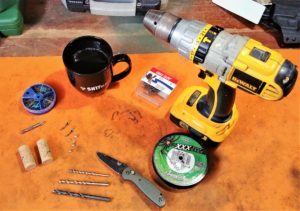 Drill and drill bits: drill bit sizes will depend on what you want to stuff inside the cork, but a ¼” bit works beautifully for my kit’s payload. Bench vise: Makes it easy to hold the cork steady and stationary. Alternately, pliers or some other similar grasping object could be used – but the vise works best. Knife: You generally use knives to cut things. Desired fishing tackle – make sure you have a nice assortment of decent-sized split shot, hooks, etc. Cup of coffee: essential for survival. 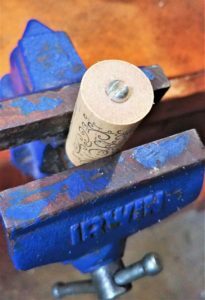 Step One: grab the cork with the bench vise, tightly enough so that the cork doesn’t spin around when you drill a hole through it with a high-speed drill bit. 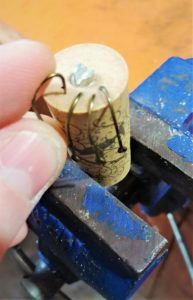 Don’t worry about over-tightening; any deformations from squishing the cork in the vise usually aren’t permanent – just in case you like your corks in pristine shape. Step Two: use the drill to make a hole all the way through the center of the cork. Drill in the long direction. I used a ¼” drill bit. Exact centering is not required, but who needs to have an OCD twitch in the middle of a survival situation? Do it right, you’ll thank me later. Step Three: Find a split shot (round line weight) that’s just slightly larger than the cork hole you just made. Stuff it in the hole to make a friction-fit stopper. Leave just enough protruding out so you can pop the split shot out of the cork with a knife point or other tool. If you drilled a hole larger than the split shot weights you can find, you’ll have to use something else to seal the whole works up. Step Four: Fill the rest of the drill-inflicted cork hole with small tackle. I stuffed a couple smaller split shot and a couple swivels in mine…though thinking back on it, the swivels are probably of minimal value for survival fishing, and the interior of the cork would be better utilized by carrying more split shot for fishing fast-moving water or replacing lost gear. Step five: Jam another large split shot in the other end of the cork to keep its contents from falling out. The cork should be effectively sealed up at this point, with whatever contents you installed in its innards. Step Six: Take your knife and cut a couple smallish notches in the cork body. This is completely optional. I did this to provide a place to tie a line around so I can use the cork as a bobber and not have to worry about whatever I use for a fishing line slip off. Step Seven: Use the outside of the cork to hold fish hooks of whatever size you’d like to have with you. I used number 6 and number 8 hooks, since the predominance of fish in the area I live in are trout, perch, and small bass which can be caught more easily on smaller hooks. Big fish can be caught on smaller hooks as well – but if the fish can’t fit the hook in its mouth, it can’t be caught – so I usually err on the smaller side. You can wind a rubber band around the hooks to keep them tight to the cork body and minimize possibility of them catching on things. Step Eight: Throw the whole works in whatever carrying/bag/glove compartment/pocket setup you have along with some fishing line and/or paracord and a knife, and rejoice in not having to try to whittle a gorge hook when you want to fish – you can devote that time to looking for bait and swatting black flies! You’re welcome! This little kit is eminently customizable within the confines of the cork’s size. I can see probably spray-painting the outside of the cork safety orange to enhance visibilty, or maybe wrapping it with tinfoil so I could set the line and cork bobber out overnight and check for its whereabouts with a flashlight once the sun goes down. Heck, you could probably even thread a couple hooks sticking out of the cork body and fashion a rudimentary top-water plug for trying to catch bass or aggressive pickerel-type fish. Make it yours – fill it with what you think works for you and the fish in your area, and try it out! I’d love to get some feedback from you, dear readers, on improvements and modifications to this way simple, borderline rudimentary survival fishing rig! Questions? Comments? Sound off in the comments below!